When approaching a class ‘P’ or Difficult site, engineers must find innovative, collaborative design solutions that mitigate risks to residential projects. There are several factors that may greatly affect the design of Slab Footings on these sites. When approaching a Class ‘P’ site, engineers at Intrax consider various elements, as discussed below, to find the most effective solution. When an engineer has encountered a site with soft soils the first step to take is to challenge and clarify the recommendations given by the geotechnical investigation. Ensure compaction reports are sighted and/or fill assessment testing is done. 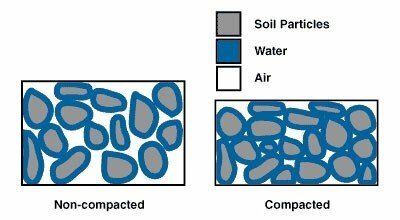 The bearing capacity of the soil has to be determined at a particular depth and a conclusion has to be drawn to what would be the most cost-effective way to support the structure. Deep footing system in the form of bored piers or screw piles. This method creates a platform that is founded at a deeper soil horizon with a larger soil bearing capacity. The loads from the structure bypass the softer soils and are directly transferred to stronger stratum. When the supporting slab is sufficiently stiffened with adequate reinforcement, the loads from the superstructure are distributed evenly across the whole area of the slab. This is similar to how the snowshoes work. The engineer should clarify the recommendations given by the geotechnical investigation to determine the slab reinforcement required in order to achieve the necessary stiffness of the slab. A ‘soft spot’ design can be recommended which involves a design based on a previously approved theory. The edge beams of the slab are designed to cantilever over spots where there is a potential loss of support. In some cases, it is possible to carry out controlled soil compaction achieving the required bearing capacity. 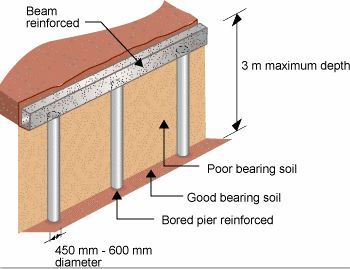 The soft soil (fill) can be stripped off the site and re-compacted in 150mm thick layers ultimately providing a satisfactory bedding for a foundation. This is done with soil compactors, rollers and excavators. Which climatic zone is the site located in? What is the suction depth (Hs), characteristic surface movement (Ys) and, surface movement due to tree (Yt)? What type of tree: is it Deciduous or Native? What is its influence zone, how high can the tree grow? Is the tree in an immature or mature state? 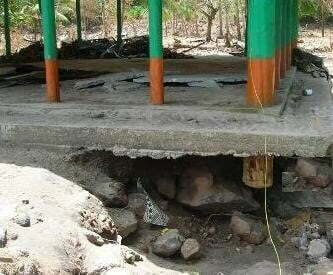 This type of footing transfers the loads of the structure below the Hs which is the suction depth of a particular tree in a particular climatic zone. When a tree has been removed the soil can experience re-moisturising which in turn can induce soil movements. A slab has to be sufficiently stiffened to account for that. Or, a wait of 9-12 months is required for the soil moisture level to stabilise. After reviewing the geotechnical report the recommendations have to be clarified or challenged. To prevent erosion and landslip the engineer is to use one of the footing types. Deep footing system such as bored piers or piles to reach the soil unaffected by the slip circle. The engineer is to challenge or clarify the recommendations given by the soil report. The client must be made aware of risks on these sites and potential for repair if required. Horizontal displacement (strains): tensile and Compression Strains are a result of differential movement between two points. The forces are transferred via friction. Waffle raft footings in concert with a high grade plastic on a sand bed layer are ideal in this application. Engineers face many challenges when engaging a Class P site. Design solutions must find innovative ways to manage issues and mitigate risks caused by the typical factors that influence these sites. The expertise Intrax brings to projects affected by difficult sites ensures an optimized engineering solution that achieves the best results and stands out amongst the competition.